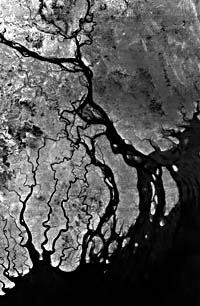 Third World communities fight the "Blue Revolution"
The Coastal Area of Bangladesh is now dominated by rich traders from the cities.The large landowners, and city based non locals mainly dominate shrimp culture in the southern districts. The poor farmers who used to grow rice are forcefully dislocated. The poor children and landless farmers collects wild shrimp fin with very fine nylon net all over the coastal area of Bangladesh and thus destroying all other bio diversity of coastal fauna (Photo: left). Naturally prawns migrate from rivers to coastal waters to breed in the saline water, on the other hand Hilsha fish, most popular fish of Bangladesh,enters from coastal water to river for breeding. Once the mighty coastal Mangrove Forest is now cleared (Photo: right). Ecosystems are threatened by fast-changing biotic communities, wetland and mangrove forest losses, environmental degradation and now destructive fishing practices. This has created serious socio-economic problems in those areas, besides ecological issues. Other natural resources and biodiversity are seriously affected or neglected by the change in environmental conditions in the area, especially cattle, poultry and goats. A big threat to other aquatic biodiversity is caused by the indiscriminate destruction of various other types of fish and shrimp fry that get captured when local people capture wild shrimp fry along the coastal tidal areas (The Independent, 27. 07. 03). Environmentalists called on the government to formulate a national policy on haor (huge water body) and cancel the system of leasing out haors in order to protect the environment and biodiversity. They also demanded steps to ensure common people's rights to wetlands through proper development plan and declaration of certain haors as sanctuary to conserve biodiversity. The demands came from a human chain programme jointly organised by the Save the Environment Movement and Jono Udyog at Shahbagh in the city. Indiscriminate killing of hilsha fry, popularly known as 'Jhatka', continues unabated despite ban on it. The Barisal-based correspondent of The Independent in his despatch said that Jhatka has flooded the local market. In contrast, 138 wholesalers of hilsha in Barisal fish market have kept their shops closed following very poor catch of the fish. Interestingly, the wholesalers, who are traditionally engaged in trading of hilsha, have now found it profitable to sell Jhatka to make over their losses. The Independent reporter who conducted an on-the-sport survey at Barisal fish market found that the quantity of Jhatka put on sale was 1300 maunds whereas only 1072 maunds of hilsha were available there. Reports have it that about 3,200 fishing trawlers and over 10,000 fishing boats fitted with 'current nets' are on the ceaseless hunt for Jhatka in different rivers and as far away as in the Bay of Bengal. Over one crore pieces of Jhatka have so far been caught in last one month and sent to various markets for sale. Over 5,000 maunds of Jhatka were sold from Barisal fish market. Dealers sell the fish usually from 4 AM to 8 AM. Most frustrating is the fact that the illegal trade of Jhatka has been continuing under the very nose of law enforcers. It is alleged that a section of the unscrupulous staff members of the fisheries department in collaboration with policemen are engaged in illegal Jhatka trade. Therefore it is difficult to check Jhatka catching even though there has been drives for seizure of current nets because the persons who are assigned to curb the practice are themselves involved in the business for personal gains. 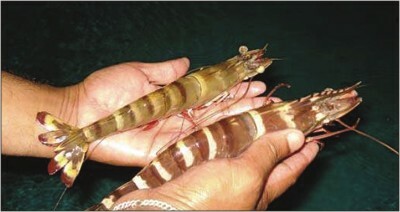 Bangladesh earns quite a good amount of foreign exchange from the export of shrimp and prawn. Shrimp export brings in the most attractive financial returns. In 1981-82, Bangladesh exported 6,903 metric tons of shrimp, worth Tk. 904 million. This rose to 18,665 metric tons amounting 4,373 million in 1987-88. Another report estimates exports of 4,386 metric tons in 1983-84, which reached 23,530 metric tons in 1992-93. Recently the amount is estimated to be about 38,000 metric tons, and it is increasing every year. Most of this comes from shrimp culture in gher or through excavation of ponds that are seeded with fry, which are later harvested. About 10,000 metric tons of the shrimp exported comes from coastal wild shrimp collection. The country catches about six lakh tonnes of fish annually worth about Taka 2,857 crore, reports BSS. Dr Giasuddin Khan and Dr Mohammad Zafar said this in their joint main paper on sea fish at a seminar on Friday organised on the occasion of the National Fish Fortnight-05 in the auditorium of BIAM in Dhaka. They said 475 species of fish, 36 species of shrimp and 21 kinds of shark and dolphin are available in the 710-kilometer sea area. Stock of the sea fish is shrinking due to lack of proper planned management, they added (The Bangladesh Observer, 21 August, 2005 ). As a consequence of the shrimp trade, a vast area in the coastal zones of Khulna, Satkhira, Bagherhat and Cox's Bazar has been converted into shrimp farm. Bangladesh has about 2.5 million hectares of brackish water, of which 0.13 million hectares is under shrimp culture (Ahmed, 1995). Two cultured species are Penaeus monodon (brackish-water prawn) and Macrobrachium rosenbergii (freshwater prawn), which are mainly cultured in ponds, beels, and paddy fields. HUNDREDS of farming and fishing communities throughout the region are protesting against the intrusion into their lands and the despoliation of their land and water resources by aquaculture farms. These farms have been set up by commercial companies, mainly in the past five to 10 years, along coastal areas, as part of national government policies and often aided technically or financially by international agencies. The shrimps, which include the large 'Tiger Prawns', are mainly exported to rich countries (especially Japan, USA and in Europe), where shrimps fetch a high price and have become a fashionable and expensive cuisine item. The rapid expansion of commercial, intensive aquaculture has often been called the 'Blue Revolution', following the term 'Green Revolution' used to describe the introduction of chemical-based agriculture. Since the 1970s, global production of cultured shrimp has jumped by incredible rates, mostly in Asia, which in 1990 produced 556,500 metric tonnes or 80 per cent of the world output. In the same year, it was also estimated that 820,000 hectares was being used for coastal shrimp aquaculture in Asia. Whilst the problems associated with the Green Revolution are now increasingly showing up, the so-called Blue Revolution is already being plagued by a wide range of environmental and social ill-effects. The salt water in the ponds seeps into the groundwater, and the increased salinity damages drinking water supply as well as surrounding agriculture land. The wastewater from the ponds pollutes the sea and marine environment, reducing and poisoning fish life. Many thousands of farms throughout the region have been adversely affected. Farmers have been displaced from their lands to make way for aquaculture, either through invasion by gangs controlled by shrimp-farm owners or through cheap acquisition of their lands by the state or by entrepreneurs to make way for the aquaculture ponds. Many more farms have been damaged by the flow of salt water from the shrimp ponds to the rice-fields, greatly reducing the farm output. Fishing communities have also been badly hit as the aquaculture ponds have blocked their access to the sea from their villages, and displaced the places where the fisherfolk land and park their boats and spread their nets. The fisherfolk's catch is also depleted by pollution from the ponds and by the capture of young shrimp by the aquaculture farms for their hatcheries. On top of these, rural households located near the shrimp farms are facing severe drinking water problems, as the farms pump out and deplete their groundwater supplies, as well as pollute the drinking water sources through saltwater and farm wastewater. As a result of these problems, protests are taking place in India, Bangladesh, Thailand, Malaysia and the Philippines. Problems in or due to aquaculture farms have also emerged in Taiwan, Vietnam, China and Thailand. And the issue is not confined to Asia: in Ecuador, there is a campaign against shrimp aquaculture, with environmental groups calling for a boycott of shrimp consumption. In Bangladesh, thousands of farmers have suffered from the invasion of their rice lands by aquaculture owners and by destruction or damage to their rice crops by seepage of salt water from the shrimp ponds. Shrimp owners have been buying up the rice farmers' infertile lands very cheaply, rendering them landless. 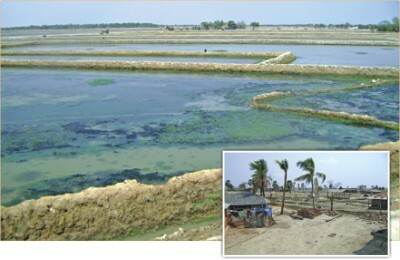 One study estimated that 300,000 people were displaced from their farmlands by aquaculture in the Satkhira region alone. Disputes between farmers and aquaculture owners have often led to violent clashes, with the death of at least two villagers to date. One of them, Jaber Ali, was killed by a bomb attack arranged by shrimp farm owners. Many communities, supported by social organisations are organising to defend themselves. In September 1994, villagers took over 32 shrimp farms in Khulna in a dispute over a large tract of rice land. 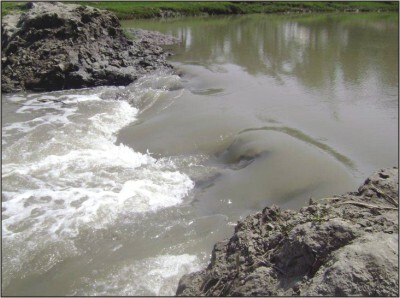 Even a moderate tidal bore could bring on a major disaster in the vast char areas of Noakhali due to unyielding deforestation by the forest bandits. The unabated felling and selling of trees by the bandits and some shrimp farming companies, with direct patronage of a section of politicians, has posed a threat to the eco-system of the area. Experts at the Forest Department in Noakhali and locals fear that a majority of those living in the chars and their adjacent areas would not survive if the area is hit by a moderate tidal wave. They said that the char areas are now totally unprotected due to the quick disappearance of the forests as influential people and shrimp traders have felled trees on thousands of acres of khas land. They use the forest bandits for this reason. According to the Forest Department, a huge forest was created through plantation of tress on 145,000 acres of char land in 1983-84. "Of which about 40,000 acres have been cleaned out in the last seven years," said an official. He fears that a majority of the four lakh char people would be killed in the event of even a modest wave hitting the coastal area. Some 42 major tidal waves, including the disastrous ones of 1970 and 1991, have hit the region in the last 125 years. "Besides, there were other moderate to small waves but no major disaster was caused due to the presence of the dense forest," said Asit Ranjan Paul, an official at the Noakhali Divisional Forest Department. He said that one-third of the 1.5 lakh (1 lakh = 1, 00000) acres of char land are now treeless. Local lawmaker Mohammad Shahjahan also echoed the same view. "Ninety-nine per cent people will die if a tidal bore hits now," he said adding the last tidal wave of 1991 could not cause a major disaster in the area due to the dense forest. Experts say due to its geographical location, the southern region of the country is in a very risky position and deforestation has made the area even more vulnerable. Local people alleged that the Forest Department could not save the huge area of forest from the tree traders. "They also fail to plant trees on the char as it has gone into the clutches of the bandits," alleged 70-year-old Karim Mia of Nangaliar Char. The local people have little hopes as they claim the char is under the grips of some influential political persons who like to see the char area cleaned for their personal and business interests (New Age, December 13, 2003). Defying a call from local lawmaker, goons hired by shrimp enclosure owners cut the dam of Chhoto Kainmari Canal in Mongla upazila to release saline water into the adjoining areas on Saturday (9. 05. 09). Farmers in Mongla upazila have vowed to resist shrimp cultivation by using saline water in croplands. Hundreds of men and women of Kainmari, Chakrakhali, Kalibari, Dasherkhando and Kanainagar villages of Chandpai union continued movement for the second day yesterday and prevented shrimp enclosure owners from releasing saline water into the paddy fields through sluice gates. Also on Saturday, hundreds of farmers of these villages foiled an attempt to release saline water into their fields with help of hired goons. Meanwhile, security has have been stepped up at several villages of Chandpai union under Mongla upazila in Bagerhat district fearing bloody clashes any moment between farmers and owners of shrimp enclosures. According to Vice Chairman of Mongla Upazila Parishad Mohammad Noor Alam, the owners of shrimp enclosures have hired goons to release saline water into the fields in the aforesaid villages defying the call by local lawmaker Begum Habibun Nahar to refrain from using force. The hired goons on Saturday noon cut the dam of Kainmari Canal to forcibly release saline water into a field. "The farmers have vowed to resist the hired goons. 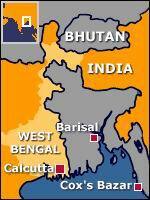 So the situation in these villages have become highly tense," said OC Feroze Ahmed at Mongla Police Station. Shubhash Mandol, Gurudas Dakua, Niva Halder and Alta Bagchi of Kalikabari village told this correspondent yesterday that release of saline water in the fields has become a big threat to their livelihood. Because it damages fertility of the fields, they pointed out. Mongla Upazila Chairman Md Iddris Ali Ijardar said anti-salinity movement is gaining momentum as farmers are now more aware about the evils of saline water-based shrimp cultivation Meanwhile lawmaker Habibun Nahar warned that any ill motive against the greater interest of the people would be severely dealt with. She said this as some owners were reportedly still planning to use force and dismantle the sluice gates with the help of hired goons. Hundreds of villagers were guarding sluice gates and shrimp enclosures of Mongla villages since start of their current protest on Saturday ((Daily Star, Monday, May 11, 2009 ). "This is the land where my family grew rice for years," said Gazi, a 60-year-old farmer at Gabura in Satkhira district close to Bay of Bengal. "Today, there is nothing but salt. Nothing else grows here," murmured Gazi, wiping sweat from his sun-burnt face. The farmer has only himself to blame. Nearly three decades ago, Gazi, like many farmers in his area, quit rice farming to opt for shrimp cultivation that earned them more money. Money Gazi has earned. His earning from the business continued until cyclone Aila hit the southwestern part of the country on May 25, 2009. The entire region was washed away. All the shrimp enclosures were gone. For about one and a half years, the area remained under saline water until the breaches Aila had created were repaired towards the end of last year. The saline water has receded after the repair but Gazi is thunderstruck to find that years of shrimp cultivation has brought saline water and salt to his three acres of land making it unfit for any crop. He wonders how many years it might take for the land to recover from the damage, and regain the soil fertility to grow crops like rice. Lured by short-term gains, farmers like Gazi, who mulls beginning with shrimp business once again, overlooked the long-term losses from shrimp farming: damage to land fertility, drinking water, and environment. But Gazi and others like him won't be able to resume the business easily with most of the farmers waging resistance against resumption of such a devastating occupation, which multiplied the impact of the cyclone on their lives. Salinity, caused by growing shrimp cultivation over the last three and a half decades, damaged the soil fertility of more than one million hectares of coastal arable land that could yield 2.5 million tonnes of rice, enough to meet the country's annual food deficit, according to the government's Soil Resources Development Institute. A recent SRDI study says about three quarters of the land cannot grow rice due to high salt content in the country's coastal districts, mainly in Khulna, Satkhira and Bagerhat. "Shrimp cultivation has deep relation with the increased salinity," said ecology and biodiversity researcher Pavel Partha. "Salt water staying in shrimp enclosure for long time causes gradual salt sedimentation in the land, which destroys fundamental element of the soil, and thus its basic composition," he added. Almost a half of the total saline affected land falls in the three southwestern districts of Satkhira, Khulna and Bagerhat. Shrimp cultivation has taken more than 77 percent of the region's agricultural land. "We are not interested in shrimp cultivation anymore. We used to produce 12 to 15 maunds of rice per bigha before the business came. Now it has come down to less than 2 maunds," said Ganesh Chandra Mandal, a farmer of Bonloudub in Khulna. Unlike Gazi, Ganesh was compelled to get into shrimp cultivation in his little piece of arable land as rice production declined due to saline water in nearby shrimp beds. Ganesh still considers him lucky to be able to stay in his village. He had the little piece of land to start shrimp cultivation. But many landless farmers who worked as farm workers had to leave their villages in search of jobs in other parts of the country. "Shrimp cultivation has also hit the landless people hard," said Ganesh. As he talked to this correspondent, Ganesh pointed to a nearby area where three canals gave way to a dam that used to reserve saline water for shrimp cultivation. Shrimp cultivation is also blamed for causing salinity in groundwater, and withering of trees. Villagers need to travel miles to collect fresh water. "It takes four hours to bring water. We leave in the afternoon and return with water late in the evening, as we have to travel up to the border of the next union for water," Ganesh's wife said. The water crisis has become acute in 80 percent of the three southwestern districts where even deep tube wells pump out saline water, and rain water turns saline once it falls on the salt-affected ground. Increased salinity also has affected homestead vegetation. Pasture land is disappearing affecting the livestock in the area. "It is beyond doubt that nothing but shrimp business is the main cause behind the increasing salinity and damage of the environment in the coastal area. But you cannot always tell the truth, especially when it earns foreign currencies," said an SRDI top official when asked why the institute's study does not focus on the cause of the problem. Shrimp cultivation first began in Munsiganj of Satkhira in 1972, outside the Bangladesh Water Development Board (BWDB) embankment, which was built in the 1960s along the coastline to save land from saline water. International market and short-term benefits brought influential people into the business. There are allegations that these people forced poor farmers to give their land for shrimp cultivation. Big land owners also joined hands with the businessmen, as they were not involved in cultivating their lands. Gradually the cultivation rolled inside the embankment and engulfed villages after villages and then districts, making thousands of farmers jobless. Shrimp cultivation reached Khulna and Bagerhat around 1980. A study found that by 1990 the protection embankment was breached at 1,100 places for shrimp cultivation, making the region vulnerable to natural disasters. As the coastal land was mono-crop, where only rice could be cultivated during rainy season, soon shrimp business became a round-the-year activity. Researchers found complete disappearance of several aquatic plants, weeds, and local fish species since the start of shrimp cultivation. Salinity is having its toll on the region's environment. Gazi has only four dying coconut trees now in his homestead, down from 276 trees of 20 varieties of fruits in the garden surrounding his house. This rapid fall in greenery occurred all over the 2,700 hectares of Gabura turning the entire area of land arid with hundreds of thousands of cracks on the ground. A study by Bangladesh Environment Lawyers Association (Bela) found shrimp cultivation blocked 105 canals in the coastal area. Only in Shahebed Abad in Khulna 64 ponds were destroyed by shrimp cultivation. In India, a strong grassroots movement has developed in the Eastern coastal states, where angry communities (helped by social groups like LAFTI and PREPARE) have organised to prevent the building of shrimp ponds and to protect themselves from gang violence caused by aquaculture companies. In Andhra Pradesh, villagers of Kurru attacked aquaculture farms, uprooting the pumps and breaching the bunds of the ponds. The activists recently won a Supreme Court order prohibiting new aquaculture works in three states. In Malaysia, several thousand fishermen have suffered big declines in fishcatch due to clearing of mangroves and river pollution caused by aquaculture ponds being set up along the coast. 3,000 fishermen in one district alone (Kuala Muda) are protesting against their loss of income. In Kerpan village, several hundred farmers defended their rice-fields from bulldozers after the state government compulsorily acquired their land for an aquaculture project; they have taken their case to court. In Ecuador, the fourth biggest cultured shrimp producer in the world, the environmental group Accion Ecologica (Ecological Action) in May called for a consumer boycott of cultured shrimp because the aquaculture industry had destroyed most of the mangrove forests in some of the country's coastal regions. At a meeting in May in Madras of some leading social and environmental groups involved in the issue, an International Campaign against Unsustainable Aquaculture was launched. At the same time, Indian organisations established a national People's Alliance against the Shrimp Industry. Once again, shrimp gher (enclosure for shrimp culture) has made screaming headlines. Land-grabbers in Kaliganj, Satkhira swooped on landless peasants on the early morning of Sunday with lethal weapons with the intention of illegally evicting the poor from the khas (government) land they have taken on lease for a year. When earlier attempt failed, this time the grabbers had bought the service of hired lathials (originally stick-wielding hired goons who now liberally use arms) to do the job. The attack came unaware and the poor farmers living in their huts had to flee their homes as those were set on fire. More than 300 bombs were exploded to scare away the peasants. No less than 400 huts were burnt down and several hundred people including children were injured, some by bullets fired at them. Hell broke loose in that morning for the poor inhabitants. Now the entire area is allegedly under the occupation of the land-grabbers. A police contingent has however been posted there. The allegation is serious: the police failed to show up promptly (they arrived after five hours), because the attackers had a secret deal with the additional superintendent of police (ASP) of Kaliganj Circle and the officer in-charge of Kaliganj thana prior to the attack. After their arrival the police, instead of arresting the attackers, had allegedly hearty talks with them. When they needed to make arrangement for sending the severely injured to hospitals, the role of the police was quite suspicious. Ever since shrimp culture has become a profitable venture, the jotedars or big farmers have unleashed a reign of terror in the area. Small farmers have become a victim of the unappeased greed of the big farmers. At times the torture reminded one of the kind meted out to farmers by indigo zaminders. In this task the local administration has always been on the side of the moneyed and influential parties. The arrest of an ASP a few weeks back for his alleged connection with the outlaws has not surprised many. He also had involvement with similar deals with shrimp-gher owners. Now the question is: if the political bosses show the way, can the members of law enforcing agency disregard the signal? They are doing what is only expected of them. But what about the NGOs? Cann't they push forward the agenda of empowerment of the poor in the gher areas? If they stand by the poor, the poor farmers stand a chance of survival. In this country there is hardly anything which is not up for a grab. Land and power grabbers in particular have earned special notoriety over the years. In this overpopulated land, there is an unhealthy competition for bringing in possession the scarce resources and acquiring wealth. The result is that the poor and the weak are getting further marginalised and the insensitive nouveu riches do not let go any opportunity to plunder whatever spoils are available there. They did not have the slightest qualm in setting aside for themselves a lion's share of the many billions of dollars in foreign aid received by the country. Social polarisation has been so complete that segments living in the country actually belong to different worlds of facilities and opportunities. The process certainly was begun by politicians and they have successfully promoted their particular brand of economic policy through their henchmen at the grassroots level of society (Editorial, Bangladesh Observer, March 1, 2005). At least 35 out of 53 shrimp hatcheries are closed in Cox's Bazar due to acute crisis of mother shrimps following their indiscriminate netting in the Bay of Bengal. Cultivation of shrimp, one of the major export earners, will suffer a serious setback for want to of fries due to crisis of mother shrimps, Yunus Chwdhury, vice-chairmen of Cox's Bazar Shrimp Hatchery Owners Association, told this correspondent yesterday. But the authorities concerned are yet to take any effective step in this regard, he alleged. Mother shrimps have virtually depleted in the costal areas in last two years because of indiscriminate netting in absence of any government policy and supervision, he said. Rais Uddin, owner of Marigold Shrimp Hatchery, said he invested around Tk one million to produce shrimp fries but his hatcheries are now facing closure due to non-availability of mother shrimps. Shrimp export is the second largest forex earner after garments. Shrimp fry production starts in January but many hatchery owners are sitting idle, the association leaders said. They said fishing in the Bay should be banned during breeding period. Otherwise, the export earning sector will be ruined, they added. They said 53 hatcheries were set up along the coast by spending crores of taka in last several years as shrimp cultivation and export became a booming business. The hatcheries in Cox's Bazar supplied fries to shrimp farms covering about one and a half lakh hectares in Cox's Bazar, Khulna and Satkhira regions. But many hatchery owners are now thinking to wind up business. Usually, mother shrimps release eggs during January- March. Fishing in Bay is officially prohibited during the period but the order is not enforced, the association leaders y said. Mother shrimps are mainly netted in coastal areas of Cox's Bazar, Kutubdia, St. Martins, Noakhali and Khulna. Fishermen from Myanmar, India and Thailand also net fishes in Bangladesh territorial waters illegally, they claimed. "Hatchery owners are now in a miserable condition", said Yunus Chowdhury. Fish resources will deplete in the Bay in two-three years if indiscriminate netting by local and foreign trawlers is not stopped, Yunus said. Even two years ago, a mother shrimp was available at between Tk 600 and 700, but now its price is not less than Tk 7,000. On average 4,000 tonnes of mother shrimps are caught annually from four fishing regions in the Bay, said Swapon Chandra Pal, an official of Cox's Bazar Sea Survey, Management and Development Project. Alive mother shrimps are sold to hatcheries at higher prices and the dead ones are frozen and smuggled out, he said. Cox's Bazar Shrimp Fry Traders' Cooperative Association President Noor Mohammad said a mature mother shrimp releases at least one crore eggs after every eight months. But young mother shrimps of 4 to 5 months are caught and sold to hatcheries, which do not release over 50,000 eggs, Swapan said. District Fishery Oficer M Kabir Ahmed also admitted that the ban on netting shrimp and other fishes in the coastal waters during breeding period is not enforced. Even two years ago, a trawler could net 250 mother shrimps in a trip, which has come down to 20-25 now, he said. Because of netting 'weak' mother shrimps, fries produced by them in hatcheries also die as they are very much prone to virus attack, he added. Whilst at grassroots level the ill effects of the commercial aquaculture farms are well known, there is still a misconception generally that aquaculture activities are environmentally friendly and augment the food supply of poor communities. This could be because aquaculture has been practised for many centuries by small farmers and fisherfolk in Asia to improve their living conditions. However, there is a vast difference between the traditional methods of the communities and the new commercialised system. As pointed out by Ian Baird in a survey of aquaculture practices and performance in Asia, the traditional aquaculture, including shrimp, was usually small-scale, used low inputs and relied on natural tidal action for water- exchange. In some countries, such as India, Bangladesh and Thailand, there is a tradition of rice/shrimp rotating system, with rice grown part of the year and shrimp and other fish species cultured the rest of the year. Chemicals, antibiotics and processed feeds were not used. In this low-yield, natural method, known as "extensive aquaculture", the harvest was small but sustainable over long periods. The catch is for family consumption or sold in local markets. The modern method is larger in scale and intensive or semi-intensive in nature. Requiring more capital, it is owned and operated by commercial and often foreign-owned companies, which mainly export the shrimp. In intensive aquaculture, selected species are bred using a dense stocking rate. To maintain the very crowded (or overcrowded) population and attain higher production efficiency, artificial feed, chemical additives and antibiotics are used. This, together with excrement from the shrimp, makes the wastewater from the ponds poisonous. The intensive nature also makes the cultured fish life very prone to disease, similar to how rice monocultures under the Green Revolution are disease-prone. According to Malaysian biologist, Nora Ibrahim, "Studies show that dense stocking rates may induce stress problems and increase susceptibility to diseases. Overcrowding leads to poor water quality due to decreased oxygen level, high accumulated metabolic products and excrement, rapid growth and transmission of noxious parasites, micro-organisms and pathogens." Besides its social and ecological effects, intensive aquaculture is also facing serious problems of disease (and environmental deterioration) in many Asian countries, calling into question the viability or production sustainability of the industry beyond a few years. In Taiwan, cultured shrimp output tumbled from the 1987 peak (when it was Asia's biggest producer) of 90,000 metric tonnes to 40,000 tonnes in 1988 and 25,000 tons in 1989. According to Ian Baird, this was largely due to epidemic-level diseases caused by viruses, bacteria and protozoan. The indiscriminate use of toxic chemicals and antibiotics also decreased the resistance of shrimps to diseases. The output fall was also due to overstocking, having too many crops a year, incorrectly using processed food, and ground subsidence (in some areas, land sunk several metres in a few years) due to over-exploitation of ground water. In India, a mysterious viral disease (termed "white spot disease") started from the end of 1994 to spread along the East Coast states of Tamil Nadu, Andhra Pradesh and Orissa and wiped out a large part of the cultured shrimp crop. In Nellore, rows upon rows of empty ponds compelled entrepreneurs to go on a forced crop holiday, reported the Economic Times (June 3, 1995). The mysterious virus continued on its destructive course decimating shrimps in thousands. Recently, the lethal virus also attacked farms in West Bengal, which accounts for more than a third of India's output. In Malaysia, there have been recent and frequent reports of widespread death of cultured prawns. This year, a newly-discovered virus attacked prawn farms in Kedah state, affecting 60 prawn farm owners, and spread to 40 farms in neighbouring Perak state, killing almost all the prawns (Utusan Konsumer, May 1995). In Ecuador, cultured shrimps were recently hit by a disease called þtauro syndromeþ caused by pesticide contamination of water. Twelve thousand hectares of shrimp ponds were shut down in the gulf of Guayaquil. Given the apparently short-term lifespan of intensive aquaculture, and the long and short-term destructive effects it has, the question arises whether a revamping of the industry is enough or possible, or whether it should be phased out. 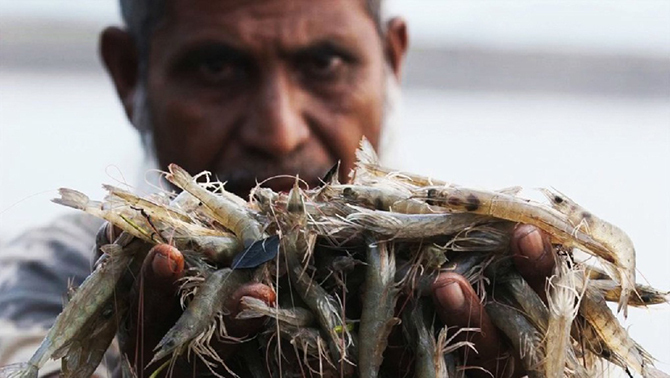 Recently, a cost-benefit analysis commissioned by the Indian Supreme Court concluded that shrimp aquaculture in two states caused more economic harm than good. In Andhra Pradesh, the social and environmental costs outweighed the economic benefits by a ratio of four to one whilst in Tamil Nadu the losses were one and a half times greater than the gains. The type of intensive aquaculture operating in many parts of the South are not beneficial to local people, and in fact cause calamity to many farming and fishing communities and the environment. It is also often not economically viable but may bring net losses to the producing countries. It is time for governments to review their aquaculture and rural policies, and for the international and regional agencies financing and encouraging aquaculture to seriously reflect on the ill effects of their funds and advice (Martin Khor, Director of Third World Network, August 10, 2001). A photojournalism project on the high demand of shrimp and the disastrous consequences in Bangladesh to ensure that the supply meets world need has been selected for the Greenpeace photo Award 2014. Miriam Künzli, a freelance Swiss photojournalist based in Zurich who worked for The Daily Star under an exchange programme in 2006 for two months, has made the project. During her stay in Bangladesh, Miriam’s experience and insights on the Bangladeshi culture, social structure and economic mechanism helped her to select the project and she titled it as ‘The Red Gold of the Sea’, more precisely, Shrimp Farming. Once synonymous with luxury, shrimp has become a mass product; farms seek to meet world consumption increasing steadily. This high demand for the ‘red gold’ has negative effects on the ecosystem. Millions of hectares of mangroves were destroyed in the world to allow shrimp farming in brackish water lagoons. Bengal tigers, river dolphins and other endangered species have their habitat disappear. The fish ponds are also contaminated with pesticides and antibiotics. The objective of Miriam’s project is to demonstrate the negative impact of shrimp production. She, in her 2:32-minute long project, wants to show the changes of the environment and the destruction of nature, but also to portray the people involved. "I want to draw the attention of the viewers in this ecological tragedy, the real price of things and the consequences of our wasteful consumption," she said (Daily Star, 18.08.14).